Combine dry active yeast, sugar, and 1/4 cup warm water in a small bowl. Let sit for 8-10 minutes (it should have bubbles in it). In a separate mixing bowl, combine flour, sugar, salt, and oil. Add yeast mixture once its ready. Use mixer to combine ingredients. It may be a little dry; add a little water as needed. Turn out dough onto a well-floured surface. Knead well for 8-10 minutes, until the dough is smooth and elastic. Let rise until puffy, about 30-40 minutes. While it’s rising, combine cinnamon and sugar in a separate bowl. Set aside. Gently deflate and shape dough into a square pillow. Roll the dough into a large rectangle of 1/8-inch thickness, with the longest side being about 2 feet long. Using a frosting knife, spread softened butter evenly across dough rectangle, leaving about an inch of one of the longer sides unbuttered. Sprinkle cinnamon sugar mixture evenly across buttered dough. Starting at longer buttered side, begin to roll up dough as you would a jelly roll. Pinch seam well. Roll rope until it’s about 5 feet long (mine reached 3.75 feet). Be sure to press along length of the dough to remove any air pockets that may form. It is normal for a few small tears to develop in the outer layer of the dough. 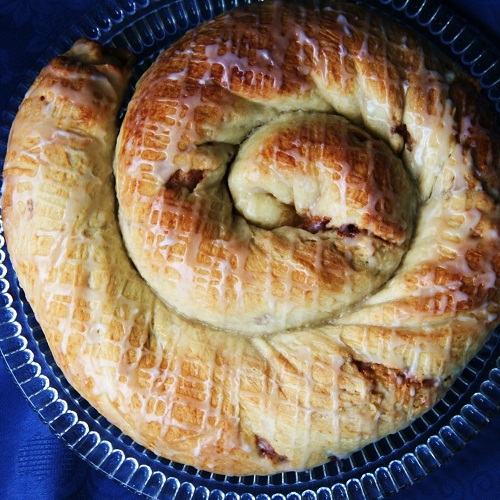 Loosely twist entire strand of dough as if you were wringing a towel. On a greased baking sheet or circular baking pan, coil rope into round spiral. Don’t wrap too tightly, as there needs to be some room for it to rise and expand. Tuck the end of rope under. With a frosting knife, spread remaining 2 Tablespoons of butter evenly onto coiled circle of dough. Set aside, covered, to rise until puffy for about 40-45 minutes. When only 5 minutes are left, begin to preheat oven to 400 degrees F.
Bake for 30-45 minutes or until deeply golden brown. Cool completely on a rack before glazing. Combine glaze ingredients in a bowl. Pour into a Ziploc bag and cut a small piece from one corner. Drizzle over bread.